Donald Trump Jr. and Kris Kobach on stage in Overland Park. 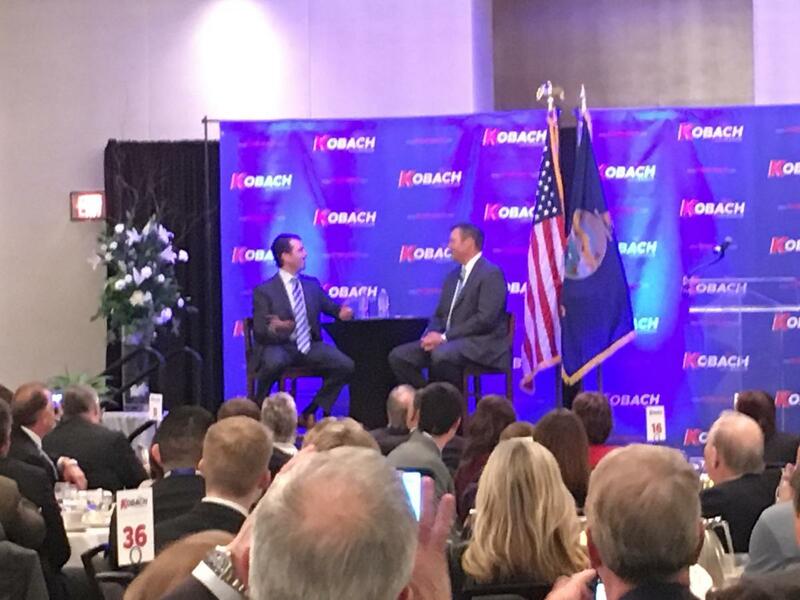 About 400 Kobach supporters paid upwards of $150 a plate to see Kobach conduct a friendly, talk-show style interview with Trump Jr. The conversation covered the younger Trump’s childhood, his relationship with his father, his love of hunting, and his memories of the campaign. Later, the pair got to questions from the audience, which Kobach read off cards. "OK," Kobach said to Trump Jr., "what is the number one threat to the United States or to the world?" "Well, obviously there’s numerous. But, candidly for me, as an American, it’s the notion of being able to sort of speak your mind freely," he answered. "When I look at both the First and Second Amendments, and the attacks on them ... uh, you know, we’re all for free speech but, you can’t say anything about Jesus Christ. You can’t say anything that’s a conservative value." Trump Jr. went on to say that the “notion that we have to live by the P.C. norm," rather than speaking common sense is a “huge threat," and Kobach agreed. Another question came from a teenager in the audience, who asked if America was great again, yet. “We’re working on it,” answered Trump. “He’s draining the swamp, but, you know, the swamp has teeth. The swamp isn’t going to make it easy. They’ve spent their lives creating this little environment that works for them and doesn’t work for the people any more. They’re not just going to give that up." Trump Jr. won applause when he attacked the media, complained about liberal influence on society and talked about his father’s efforts to slash regulations. He didn’t formally get behind Kobach in the crowded GOP gubernatorial primary, but many in the crowd took his presence as a tacit endorsement. As Kobach and Trump Jr. dined with campaign contributors, two groups of protestors massed outside the hotel. More than 100 people participated in a rally against what they called the “racist voter suppression policies” of Kobach and President Donald Trump. Across the street, a boisterous band of about 10 Trump supporters staged a counter demonstration. Protesters marching to the Kobach/Trump Jr. fundraiser. 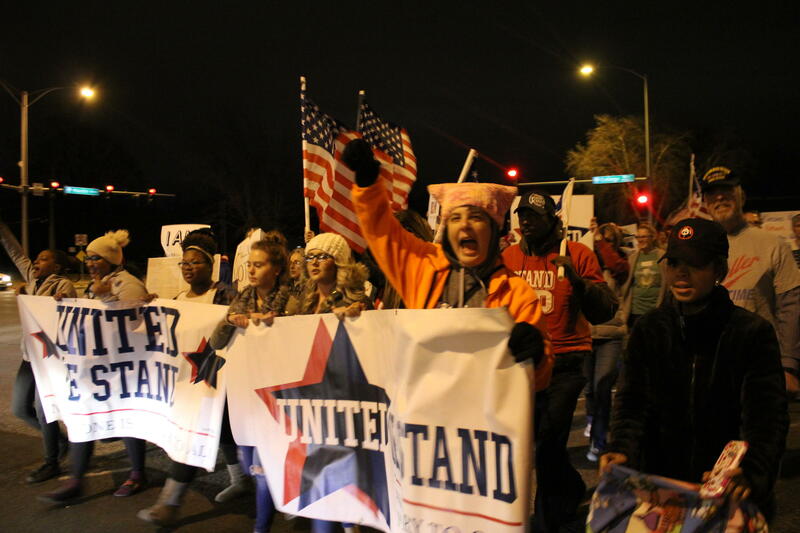 Topeka college student Patrick Maker said the smaller group represented a growing number of young conservatives who support the president and candidates like Kobach. Patricia Mullins, an attorney and leader of Indivisible KC, helped organize the anti-Kobach demonstration. “As secretary of state of Kansas and the leader of Trump’s commission to suppress votes, Kobach is trying to expand his racist, anti-immigrant nativist policies," Mullins said, referring to Kobach’s role as vice-chair of a presidential commission charged with investigating voter fraud in U.S. elections. Such extreme rhetoric unfairly labels supporters of Trump and Kobach, Maker said.